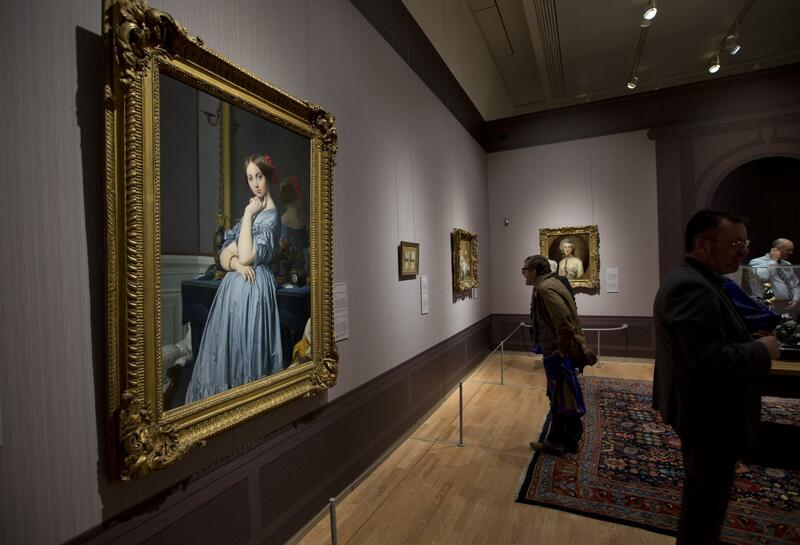 Photo Associated Press: Feb. 3, 2015 during a press preview, Jean-Auguste-Dominique Ingres’ portrait of the doe-eyed Comtesse d’Haussonville is seen at left during the exhibition titled The Frick Collection – Art Treasures from New York that runs until May 10th at Mauritshuis museum in The Hague, Netherlands. How do you say “Thank you” to a museum that loaned you Johannes Vermeer’s “Girl with a Pearl Earring” and Carel Fabritius’s “Goldfinch” ? New York’s Frick Collection is showing its gratitude to the Mauritshuis by sending over a trove of masterpieces of its own for the first major exhibition since the intimate Hague museum’s renovation. Frick Collection is one of the most stunning and mesmerizing museums in New York City. If you ever find yourself on the Upper East Side in Manhattan, on the Fifth Avenue make sure to visit this small art museum. The museum is located in the Henry Clay Frick house and it represents the art that Frick and his family collected over the years. The mansion was constructed in 1912–1914 by Thomas Hastings and it was ready for Frick to move in with his family by November 1914. Henry Frick (1849–1919) was an industrialist who had a passion for art and he started collecting the most beautiful and expensive paintings and sculptures at the time. He lived between Pittsburgh and New York and his family finally moved to New York City in 1905. He lived on the East 70th Street on the Fifth Avenue until his death. His will was to redesign the house and create a public museum from the house that once was his home. Frick’s widow, Adelaide Frick lived in the mansion with her daughter, Helen after Henry’s death. The adaptation of their home into the public museum started when his widow, Adelaide, died in 1931. American architect, John Russell Pope redesigned and enlarged the mansion in the early 1930s and Frick Collection was open for public on December 16, 1935. After that, Frick Collection has been enlarged twice, in 1977 and 2011. These changes altered the original look and appearance of the house. The magic behind Frick Collection is the feeling that this astonishing mansion full of paintings and fine furniture was a residence for Frick and his family. Some of the paintings are still arranged as they were when Frick was still alive. The Frick Collection includes some of the best known painting by European artists: Francisco Goya, El Greco, Rembrandt, Giovanni Bellini, Hans Holbein the Younger, Jan Vermeer, François Boucher, Pierre-Auguste Renoir and many other celebrated artists. The museum also has astonishing French furniture from 18th century, Oriental rugs, Sèvres porcelain and Limoges enamel. Frick’s daughter, Helen expended the collection with the art that was acquired after her father died in 1919. The building has three floors: the ground floor with six galleries is open for the general public, while second and third floor are closed for the public. The second floor has private rooms, such as bedrooms, the breakfast room, Frick’s personal sitting rooms, guest rooms and other rooms. The third floor was designed for 27 servants that worked for Frick and his family. The basement had a large kitchen and it was service area at the time. The furniture, art and decorative objects in this museum are one of a kind. It is amazing that this small museum was home for Frick’s family nearly a century ago. The Frick Collection has the research center in the fields of art history and collecting. According to The Art Newspaper, 275,000 to 300,000 people from all over the world come to visit this small and lovely museum.